« Ketchup Time Again…Lots Going On! It is now cloudy and rainy. Hit the high temperature earlier today and it is now 59 degrees. Looks like tomorrow we will see more showers, but through the weekend into Monday, no rain and temperatures in the low to mid 60s. Pretty much the same generation patters today that we have seen the past two days. Projection for tomorrow is pretty much the same. Stan and Gina on the water this morning. Stan had Bill from Williamsburg, VA. They had a fun day with the red midge and red San Juan worm dropper. The highlight of the outting was catching fish in the film on the size 20 black midge pupa. For a while they were coming up like crazy! Gina had Dan from Waco, TX out again. They did some more work on casting and even caught a few fish, including a white bass while they were stripping a floozie. Those floozies will attract anything! 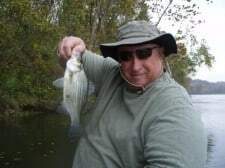 This entry was posted on Wednesday, October 26th, 2011 at 4:50 pm	and is filed under Fishing Reports. You can follow any responses to this entry through the RSS 2.0 feed. You can leave a response, or trackback from your own site.